Last autumn, Julius Lester honored us by letting me share on the blog an essay he had written about Rosh Hashanah. I had never heard of the man before reading his essay, which was thanks to a mutual friend, Paula Marie Gourley, and I had no idea how esteemed he was when I asked her to ask him if I could share his essay on the blog. But Paula did ask, and Julius graciously said yes. And apparently I needed to read it again, because just yesterday I wished a colleague at work a happy new year. Julius would not have approved. Rosh Hashanah begins Sunday night, September 9. I don’t like it when gentile and Jewish friends greet me at Rosh Hashanah with “Happy New Year.” Rosh Hashanah is not the Jewish equivalent of January 1. But I have never understood what “Happy New Year” is supposed to mean. I’ve never been sure that I want to be wished happiness. I’m not sure I know what happiness is, or that it is as important as we think. Happiness feels better than misery, but some of the most significant periods of my life have been the ones of profound unhappiness. For all the feelings of well-being that happiness bestows upon us, it is not a goal of life. I may spend the next year totally depressed, but that may be where I need to be in my life. A better greeting at Rosh Hashanah is “May you have a sweet and good year.” Even if the next year is a difficult one for me, it may be a good year, even a sweet one, even though it feels otherwise. There is another aspect to Rosh Hashanah. It is also known as hayom harat olam––“the birthday of the world.” On our birthdays we mark our passage through time. One year of our lives has ended; a new one has begun. Rosh Hashanah is an invitation to mark the passages through time that have taken place in our world, and how big or inclusive “our world” is depends on the person. On birthdays we celebrate what has been and anticipate with joy what is to come. The ten days from Rosh Hashanah to Yom Kippur are called Yamim Noraim––“Days of Awe.” It is a space in time for reflection, a time to withdraw energy from the world in order to renew one’s love for the world. We withdraw from the world in order to become more conscious of who we are and what our relationship to the world has been during the previous year. It is a way of celebrating the world, not by blowing noisemakers and getting drunk, but by taking responsibility for who we are in the world, because, in the deepest sense we are the world. It would be incredible if, once a year, for ten days, the world would close up. The television and radio stations would go off the air (and ten days without hearing anything about Donald Trump would be purifying). Newspapers would stop publishing; the internet would shut off (though sales of tranquilizers would sky rocket just to quiet my anxieties as I suffered through internet withdrawal); companies would pay employees not to come to work, stores not selling essentials like food would be closed. For ten days people would reflect on and talk to each other about what they had done to the world over the previous twelve months. What had they done that contributed to easing suffering of any kind? What had they done that contributed to increasing joy of any kind? And what could they do in the coming year to alleviate needless pain and contribute to senseless joy? I know. I am an unreconstructed and unrepentant idealist. But so are Rosh Hashanah and Yamim Noraim. They hold before us unattainable ideals which we must strive toward if we are going to be as fully and wonderfully human as is within our grasp. The greeting I prefer at this time of the year is L’shanah Tovah. Literally, it means “To a good year.” This leads me, at least, to reflect on what is “good,” which creates possibilities for new ways of being, creative ways of doing. However, if one is not comfortable with Hebrew, say “Have a sweet year,” or “Have a prosperous and sweet year,” or anything that comes from your heart. But please save “Happy New Year” for December and January. Thank you Julius and Paula, and to Pearl and her Aunt Ida. 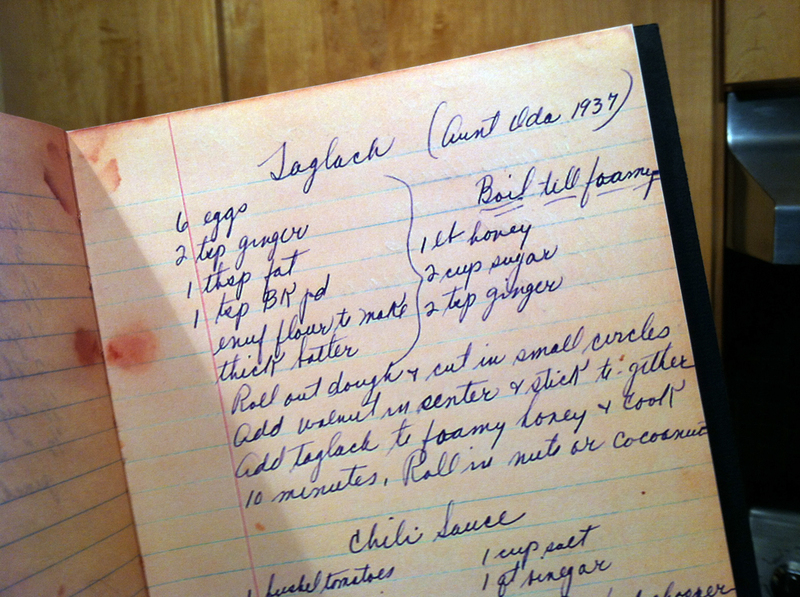 A few years ago Pearl’s daughter Rita asked me to make facsimile copies of Pearl’s handwritten recipe book for her children, Pearl’s grandkids. I thought it was a wonderful book, and I couldn’t resist making a copy for myself, too. And now you and I know how to make Aunt Ida’s Taglach, too. L’shanah Tovah. Essay © 2017 Julius Lester. L’shanah Tovah, John. May it be a very good and sweet one for all. L”Shana Tova dear creative and thoughtful friend! Julius Lester was a wonderful children’s book author. His friend and collaborator, Jerry Pinkney created fine books together. Pinkney had a learning disability but overcame it with his wonderful drawings. Julius Lester went on to higher education and had a radio program and was a Professor of Black Studies. Lester chose to convert and become Jewish. .